These are two versions of the same needlework kit, and both versions were stitched by Margaret Cobleigh, who kindly sent along the photos. I had mentioned her improvement of this pansy kit a while ago, but since she’s getting ready to teach a class in thread painting, she dug out both photos to show her embroidery group the difference between the two projects. I thought it would be interesting to line them up together in one post, to demonstrate why, as Margaret put it, two threads are not always better than one! Here’s the first version, worked according to the kit instructions, which called for two threads in the needle while embroidering. Notice especially the lower petals of the pansy, the light shades on the outside and the black on the inside. I wouldn’t look at it and call it “bad” – but it certainly isn’t as smooth and blended as I expect thread painting to be. It’s thick and heavy-looking and the color breaks are rather chunky. Here’s the second attempt. The only difference is that Margaret used one thread, instead of two. 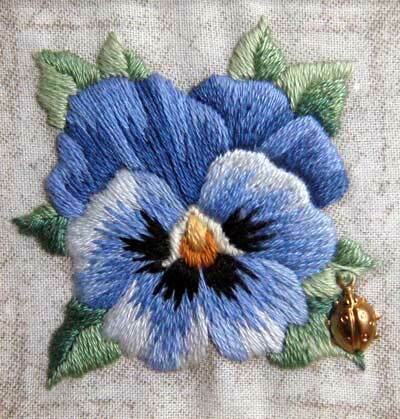 To see the point clearly – that one thread works better than two when you’re trying to shade using long and short stitch – look especially at the middle petal on the right side of the pansy. I think it illustrates the point best. In fact, all the lower petals show very well a smooth blending of shades. Overall, the blending in the whole piece is much smoother, not nearly as chunky or heavy looking. So there’s a tip for those of you who are thinking about venturing into thread painting this year… better results are achieved with one thread! It’s always tempting to double your thread when you’re covering space in embroidery. After all, you’ll cover twice as much space in the same stitching time if you’re using twice as much thread! Well…. even if that is true, you may not be as pleased with the results! This holds true with long and short stitch shading (shown here) as well as with satin stitch. You can get a far smoother satin stitch with one thread than you can with two or more. On another note, I realized I forgot to wish everyone a Happy New Year yesterday! But then, New Year’s Day is never really the day I start the “new year” – resolutions and all that. It’s still a holiday, after all! So, on this Second Day of January, 2009, please be assured of my sincere wishes for a very happy New Year to all of you. May you fulfill all your plans for this year in health and happiness. Thank you as well for all your very kind comments on my recent weekend stitching marathon. A couple questions crept up in the comments – I’ll answer those there soon. Have a great Friday, enjoy the weekend, and I’ll keep you posted on this weekend’s project as I finish it! It’s a fun one! I whole heartedly agree. I recently finished a Nosegay sampler, and my work looked very chunky. I had a second one and worked it with only 1 thread, and presto it looked like it should have. To my benefit I had many threads left over. Thank you for this info I only wished I had it earlier to prevent my mistake. When I saw the first picture I thought it was very pretty and couldn’t understand what you were objecting to. Then I scrolled down and saw the second pansy. Wow! who would have thought a single extra strand would make such a difference?!!! I’m converted. I’ll never use two threads again! Wow – what a good illustration of the difference! Thanks, Mary for sharing this precious tip. Hope you’ll have a very very good 2009. Can I be contentious and say I prefer the first work? The second for me is too ethereal and lacks life. Take a photo if you waznt nature replicated! I like art to have some welly – a bit of interpretation. The first example has that. It comes alive as pansies really do when you see them – it is vibrant and textured. The other sample fades and seems insignificant. However, I like crewel work, textured surfaces and a free hand, so take no notice of me! 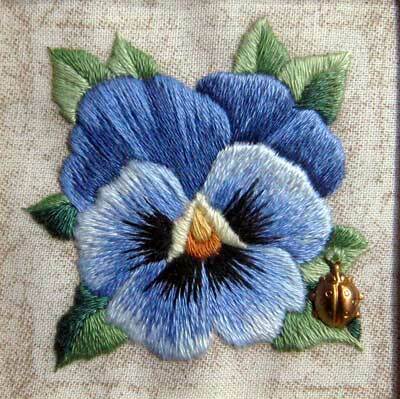 I am interested in finding a pattern for the thread painted blue pansy (example 2). Do you sell them? In the “Thread Painting” article you use one thread. What type of thread are you referring to, a single strand of six strand DMC or perle cotton?